One of the things I love most about the App Store is that it gives game developers the opportunity to experiment with a wide variety of different genres and hybrids. Some of the best games I’ve played have been those titles that simply managed to think outside the box and create something that, while certainly unique, simply nails all the requisite elements for what makes a game awesome. King Cashing: Slots Adventure [$0.99] is one of those games. 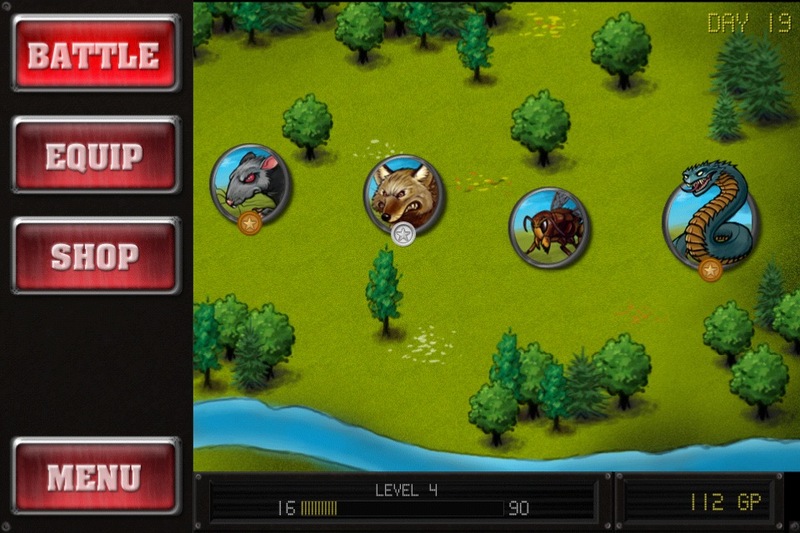 A mixture of RPG and Casino elements, King Cashing strikes the perfect balance between approachable gameplay with the strategy and depth of a role playing game, and is certainly worth a play through. King Cashing takes a lot of inspiration from the basic tenets of role playing games. You play as a king on an adventure to storm the dark castle and take down the evil antagonist. Along the way you will encounter a large variety of different monsters and boss enemies. There is an experience/leveling system, along with a decent inventory system including a wide variety of weapons and items. In addition, there are also “side quests” in the form of optional monsters that don’t need to be beaten to advance, but can offer serious rewards if you manage to take them down (and they are very difficult to actually defeat). Sure, the actual story mode, as well as the majority of the enemies, isn’t particularly special, but I think of them as simply necessary game elements in order to keep you playing its unique combat. Where King Cashing deviates from the normal RPG experience is with its battle system which is completely controlled by a slot machine. 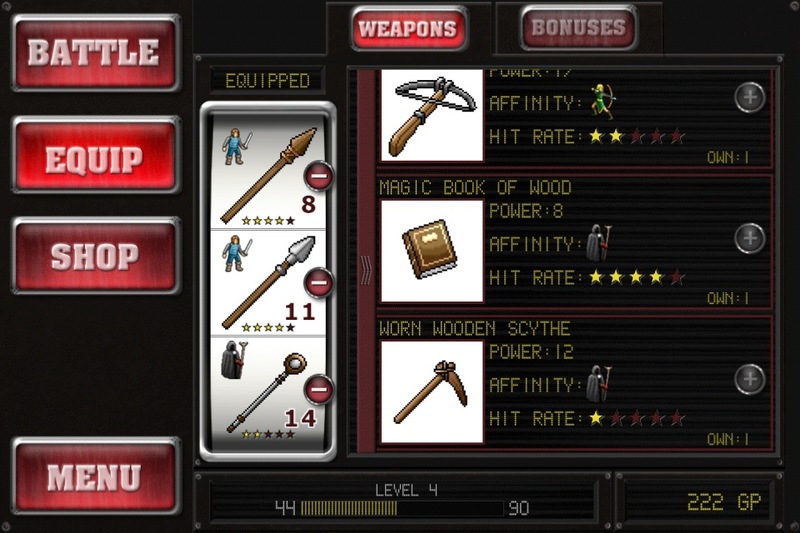 Each of the three slot columns have different types of modifiers: the left column has your party characters (warrior, archer or mage), the middle column has your equipped weapons, and the right column has your enemies. In order to attack your enemy, you must match an enemy modifier with a character or weapon on the same row. If you manage to match both a character and weapon with an enemy, your damage output increases. Match a character with a weapon that they’re affiliated with, and that damage exponentially increases. Other modifiers, such as extra spins (cherries), experience, gold and ‘misses,’ are also littered throughout the slot field. Simply put, the entire system works extremely well, although it would have been nice to be able to choose how many rows you want to actually bet on per turn (currently you can only place ‘max’ bets for all three rows unless you’re down to less than three cherries). While a slot machine battle system is inherently ruled by a large amount of chance, King Cashing does a great job of providing players with the tools to modify those chances in various ways based on game style. For example, there are three general types of weapons for each of the three classes (for a total of nine base weapons), and each of the general weapon types have different damage outputs as well as an accuracy rating, which dictates how many ‘misses’ are on the slot board. As such, you have to decide whether you will risk a higher chance of landing on a miss to gain more damage, or if you’ll play it safe with more accurate, less powerful weapons. Also, since affiliation plays a big role in weapon damage, you’ll have to decide whether to load up on weapons designed for one character, or if you’ll spread out the affinity. Monsters can also be strong or weak against certain enemies, and can even affect the appearance of enemy modifiers and slot speed, adding even more strategy to the mix. Maybe it’s the inherent intrigue of the slot machine, but I just couldn’t put down King Cashing. Each enemy can be fought again as many times as you wish in order to gain both additional gold and experience. In addition, you’re assessed a ranking at the end of each battle based on how fast you beat your opponent. As my party gained experience and acquired new weapons, I always wanted to go back to earlier opponents and bosses to try and get the elusive gold ranking. Also, I just simply found the slot machine concept for the battle system to be incredibly quick and easy, especially considering players are given the option of quickly stopping each column simultaneously (for quick play) or line by line (for more strategy). The entire gameplay experience just worked for me, particularly as a title that you can play in short bursts when you have a few minutes to spare. As you reach the endgame, you’ll have to do some grinding on previous baddies in order to raise your level and increase the odds of future victory, but RPG gamers are certainly familiar with that genre staple and some, like me, actually don’t mind the need to continually progress and level up. Interestingly enough, King Cashing also has a separate leaderboard for gamers that measures who can beat the game in the least amount of days (read: battles), which in itself would require a completely different play strategy. King Cashing certainly isn’t for everyone, particularly if you’re not a fan of RPGs or the slot-machine mechanic. However, for anyone that’s remotely interested, you owe it to yourself to check it out. It’s certainly getting some interest in our forums, and I think its approachable gameplay combined with a decent slice of strategy and standard RPG tropes may get you hooked.